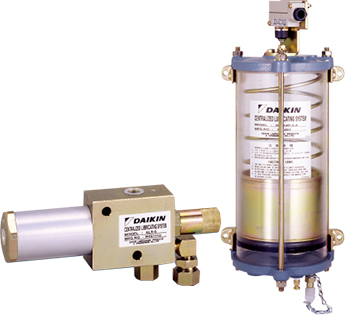 ALS.MSA.HLS.RG (Compact Pump/Isolated Type Reservoir) | Products | Daikin Lubrication Products & Engineering Co., Ltd. This lineup of compact pumps that can be driven by air or oil pressure is available for single line centralized lubricating systems as shown in the table below. With all of these compact pumps, a single plunger is operated by pneumatic or hydraulic force to pressure-feed lubricant. They can perform reliable lubrication by simple control by using the power of the main machinery, which makes them suited to medium- and small-scale machine installations. These pumps are used in combination with the isolated type reservoirs listed on the following page. • As the power of the main machinery is used, little total power is needed and the control system can be kept simple. • Optimum lubrication amounts can be set as the pump discharge quantity per shot can be adjusted. • The pump and reservoir can be installed separate from each other, which means that they can be installed at the ideal locations. Pump type Drive source MPa Max. * The grease used is NLGI consistency #0 to #1 for centralized lubrication.